Two big Mexican names were in action last night south of the border with ex-three weight world champion Humberto Soto and former world middleweight title challenger Marco Antonio Rubio treading the boards on separate fight cards. Soto, who gave up his WBC lightweight crown in July after four successful title defenses, was operating officially as a light welter for the first time in a scheduled ten round affair with former WBA lightweight strapholder Jose Alfaro at a packed Estadio Centario in Los Mochis, Mexico. Buoyed by a rabid hometown audience, Soto went right to work, stalking his Nicaraguan rival with an effective jab that kept Alfaro guessing. Soto's pressure had Alfaro struggling to find his own offense and by the end of the first round, the local icon had shaken the visitor with a bracing straight right, left hook sequence. Alfaro came out more aggressive in the second but was immediately countered by a four punch combination from Soto that also saw an accidental head clash, leaving both fighters with bad cuts above the right eye. After the combatants were each examined by ringside doctors, the action resumed and Soto went after Alfaro at a torrid pace. Alfaro was nailed with two left hooks that sent him reeling but the Nagarote man somehow kept his feet, trying to alternately hold and punch back. As Soto came in to deal out more punishment, he was caught with a good right from Alfaro, who then, after another accidental head clash, turned his back to Soto in a corner. Soto punched Alfaro a few times from this position until the referee broke the fighters and brought an obviously upset Alfaro, now badly cut on the left cheek as well, back to the fray. 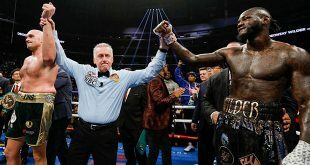 The slugfest resumed with Soto getting in good shots until the referee took Alfaro aside for another medical examination, after which Alfaro appeared to have himself waved off the fight at 1:00 of the second frame, although officially the referee was announced as having stopped the action. 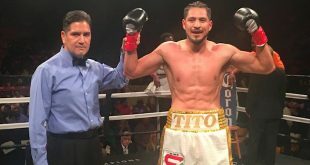 Soto wins his 13th bout in a row, improving to 56-7-2 (33), while Alfaro drops to 25-8 (22), having gone 2-4 over his last six appearances. At Centros de Convenciones in San Luis Potosi, top rated WBC middleweight Marco Antonio Rubio won the Interim WBC Latino belt with a win against Ghana's Mohammed Akrong. Ex-ABU and Ghanaian champ Akrong came into the bout having won his last seven appearances inside the distance and he certainly came to fight, walking forward the entire bout, putting pressure on Rubio. 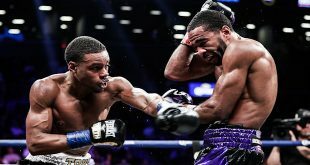 This was definitely not the strategy to go with against the biggest puncher in the division but neither man had any difficulty whatsoever in hitting the opponent as defense was rarely employed. Rubio was definitely the better boxer, however, as he mixed in effective body shots amid the work upstairs while Akrong simply focused on the head of the Mexican. By the fourth, Akrong was clearly getting hurt but did not waver in his high volume approach. Rubio continued to get in the more effective work and his body punching paid dividends in the fifth as Akrong crumpled after fielding a left to the ribs and indicated to the referee he did not want to continue. Rubio moves to 52-5-1 (45), Akrong drops to 13-4 (10).